I love to read old articles on hostesses and their styles of entertaining. Sometimes, I glean practical tips, while other times, the sheer elaborateness of their dinners and parties provides me with moments of escapism. Try as we might, duplicating some of these old parties often requires the patience of Job and a bank account worthy of Croesus. One hostess who seems refreshingly practical is Charlotte Ford. 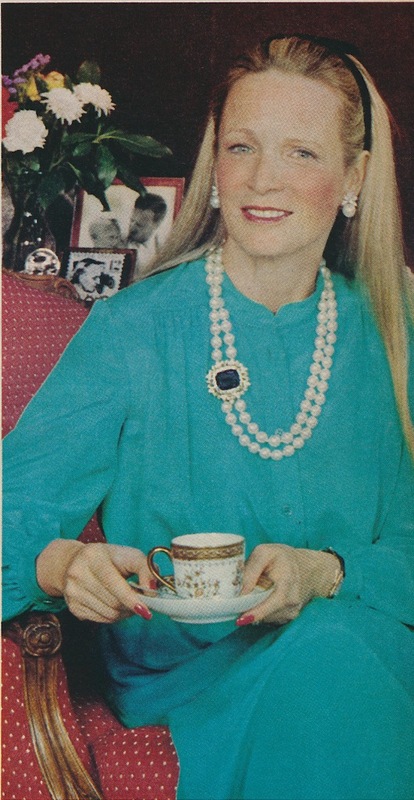 I found this article about her in a 1977 issue of House Beautiful, and at the time the article was published, Ford was a busy working woman designing a line of clothing. With her hectic workday schedule, Ford admitted that she was only able to entertain about once a month. 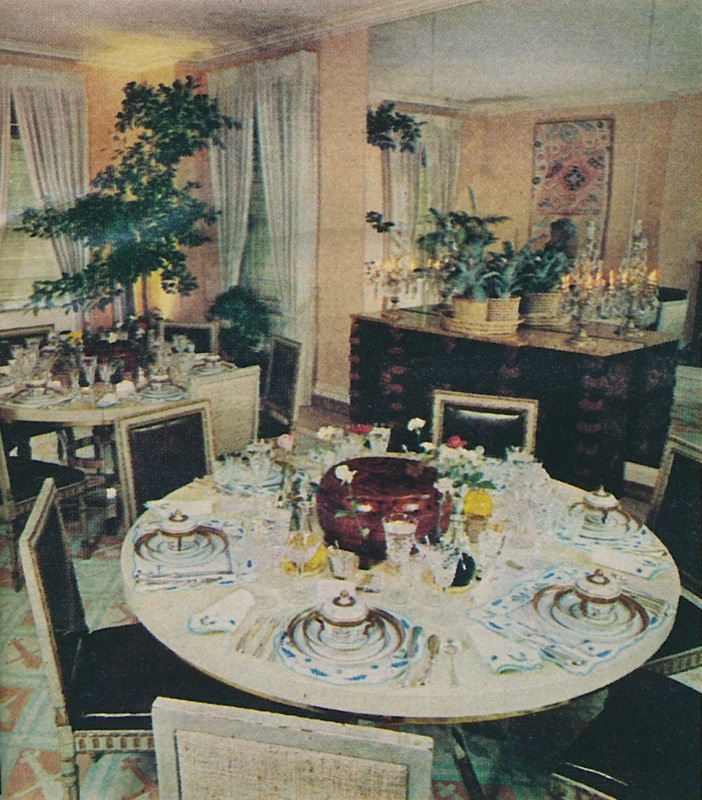 Taking a more casual (for that time) approach to entertaining, Ford eschewed long, laborious dinner parties of numerous courses. 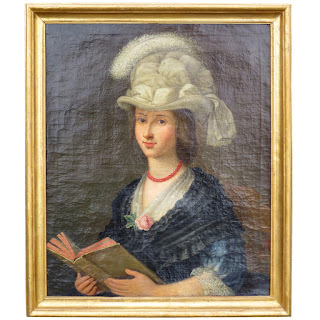 Instead, she said that she preferred to serve an appetizer, an entree of turkey (according to Ford, men particularly seemed to love turkey) and a vegetable, and, to end the meal, either a salad and cheese or dessert. 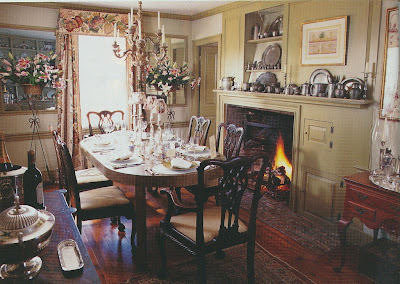 What especially caught my eye were Ford's lovely dining tables. Preferring to set two round tables for six, Ford laid her table with French-made china designed especially for the Ford family, Baccarat crystal, and those lovely Porthault embroidered mats and napkins. 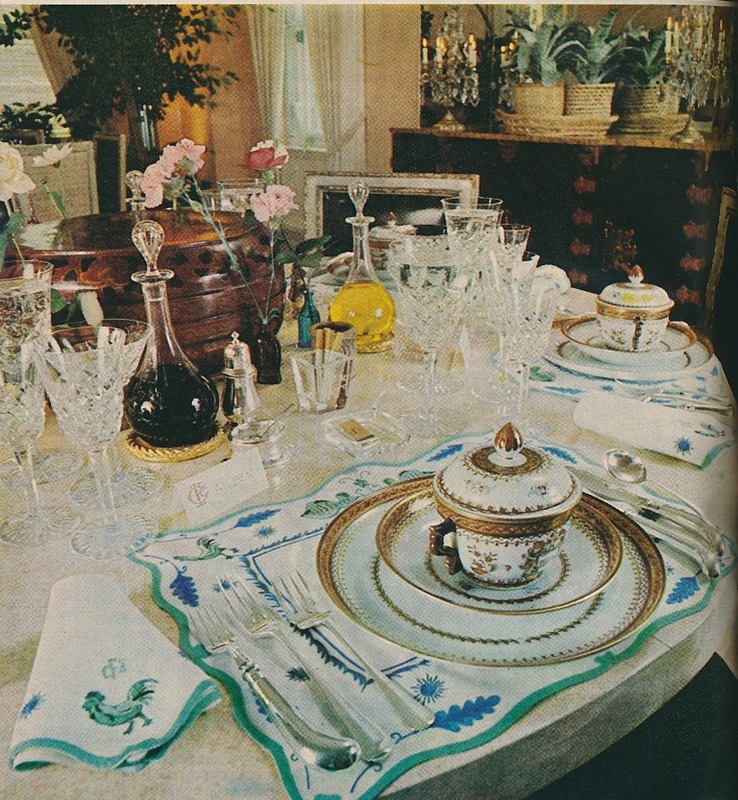 I think Ford's table linens are my favorite part of the entire article. You'll also notice the little cigarette holders, an accessory that, at that time, were practically a requirement on well-set tables. 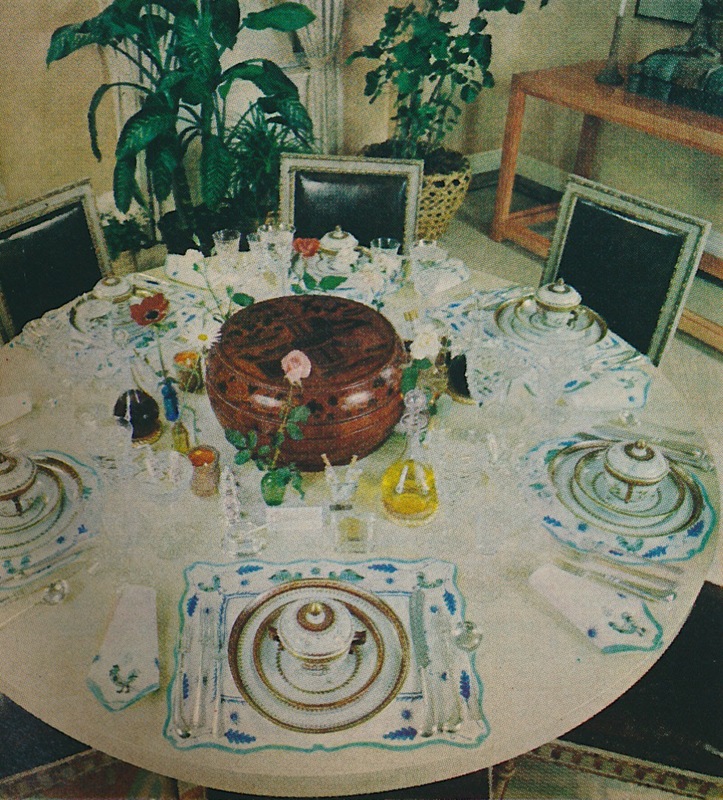 Times may have changed, but a beautifully set table never goes out of style! 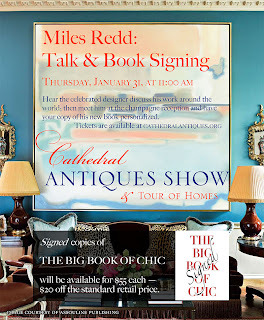 I do hope that my Georgia readers will have the opportunity to attend Miles Redd's lecture this Thursday, 11 a.m., at the Cathedral of Saint Philip. Just one of the many highlights of this year's Cathedral Antiques Show, Miles' lecture is sure to be entertaining. 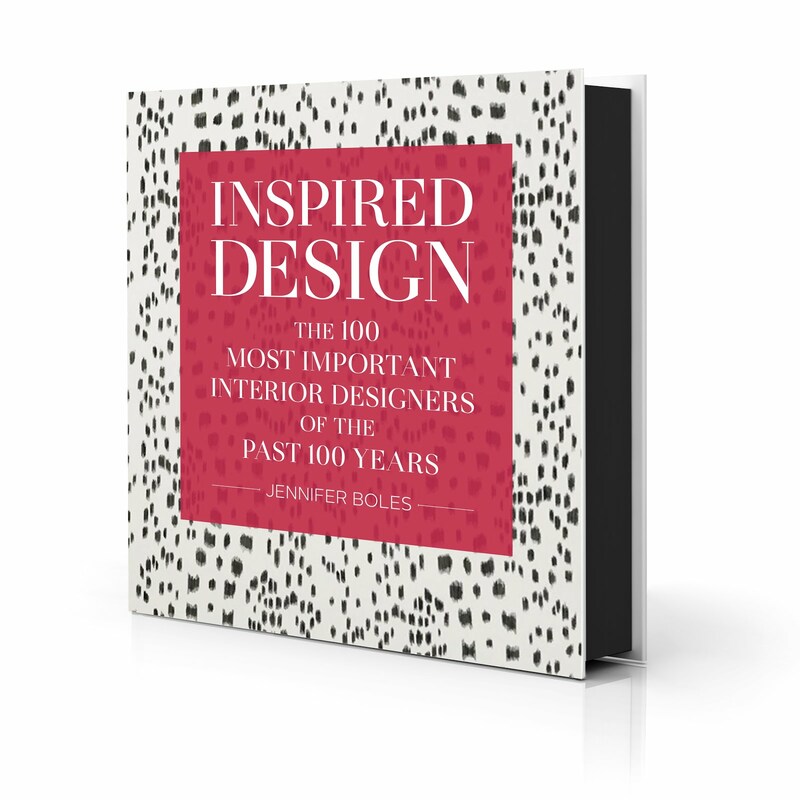 The bonus of attending the lecture is that Miles' book, The Big Book of Chic, will be available for purchase at a discount: $55 per book, a $20 savings. 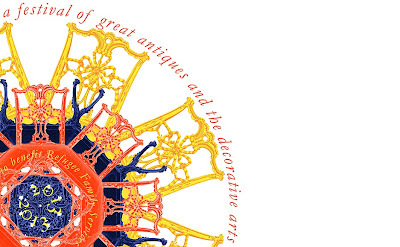 For more information, please visit the Cathedral Antiques Show website. And don't forget to visit the Inspiration House as well! Every time I flip through my copy of Robert Harling's House & Garden Guide to Interior Decoration, I stop and stare at the photo above. 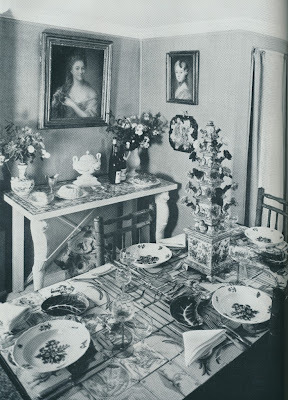 According to the book's text, the photo shows "the dining room of the lodge of Ockham Park in Surrey, decorated by Felix Harbord for himself." Unfortunately, there is not much information on the internet about the late Harbord, a British decorator and theater designer. What I did learn, though, was that Harbord was hired by a late owner of Ockham Park, a 17th century house designed by architect Nicholas Hawksmoor, to decorate and renovate the house in 1961. Perhaps some of you can shed additional light on Harbord's work at Ockham Park. Anyway, I find Harbord's dining room so fanciful. Both the dining table and console table were covered in Delft blue and white tiles, while Harbord's plates were Meissen. And despite the fact that the room only measured 9 feet by twelve feet, Harbord's table measured 6 feet long. He certainly packed a lot of punch into one room. 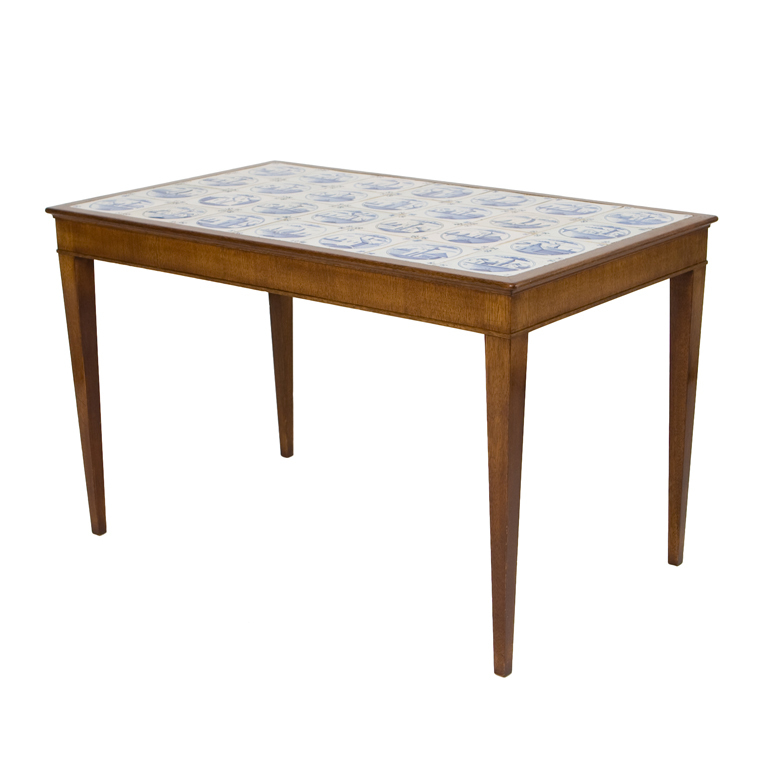 If it were slightly taller, this c. 1940s Frits Henningsen Mahogany and Delft Tile cocktail table would be a charming substitute for Harbord's dining table. 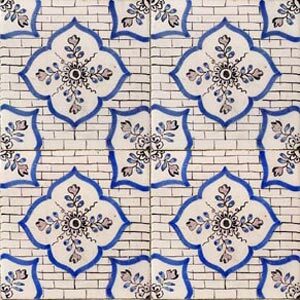 Or, you could simply tile the top of a table with some of the beautiful tile from Solar Antique Tiles. 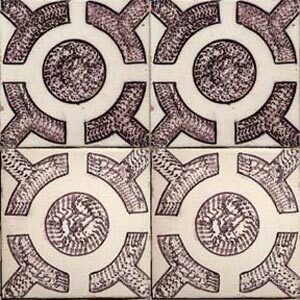 The two photos show Dutch patterned tile, but there are many other patterns from which to choose. 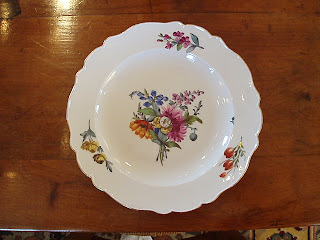 Harbord's Meissen plates look similar to these 18th century Meissen Marcolini dinner plates, available at Stillwell House Antiques. I love Harbord's cabbageware crescent salad plates. 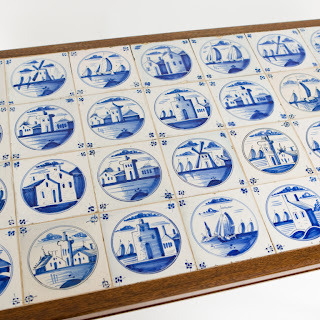 Bordallo Pinheiro made a similar plate, seen above, that can be found from time to time on Replacements. 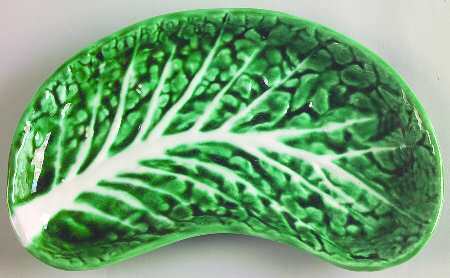 Although the plate above isn't crescent shaped, this seemed an opportune time to slip in a photo of a cabbageware starter plate that looks adorable. 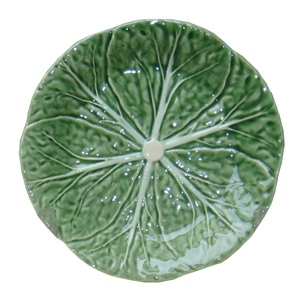 This and other cabbageware pieces are available through Pigott's Store in Australia. 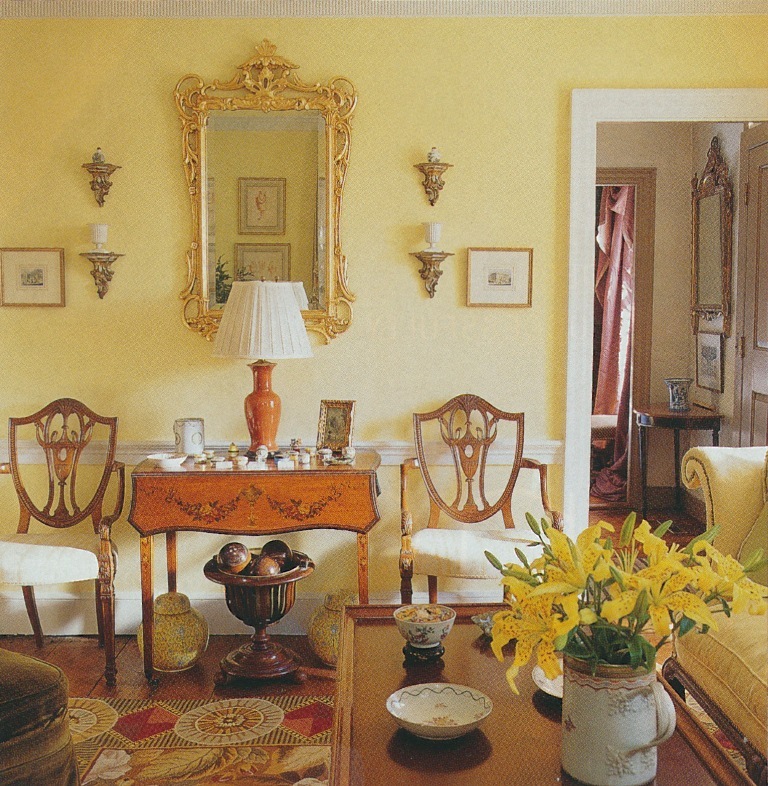 Mottahedeh's Chatsworth Tulipiere would make a smashing centerpiece, especially against a tiled-top table. And to watch over the table, this portrait of lady, available from Parc Monceau Antiques, is reminiscent of the paintings in Harbord's room. 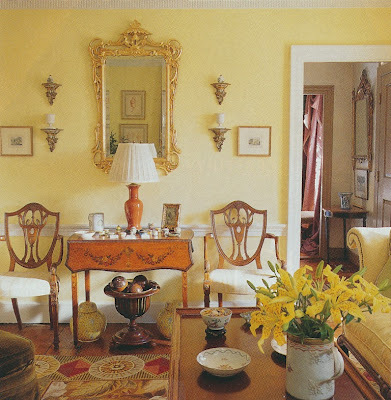 To those who live in Atlanta and environs, I invite you to attend next week's Cathedral Antiques Show & Tour of Homes. While the main event is the antiques show itself, which runs January 31st through February 2nd, there will also be a tour of homes, the Inspiration House show house, and a talk and book signing by Miles Redd. Miles' lecture will take place next Thursday, January 31st at 11:00 a.m. at the Cathedral of St. Philip. Yours truly will be introducing him. I hope to see you there! 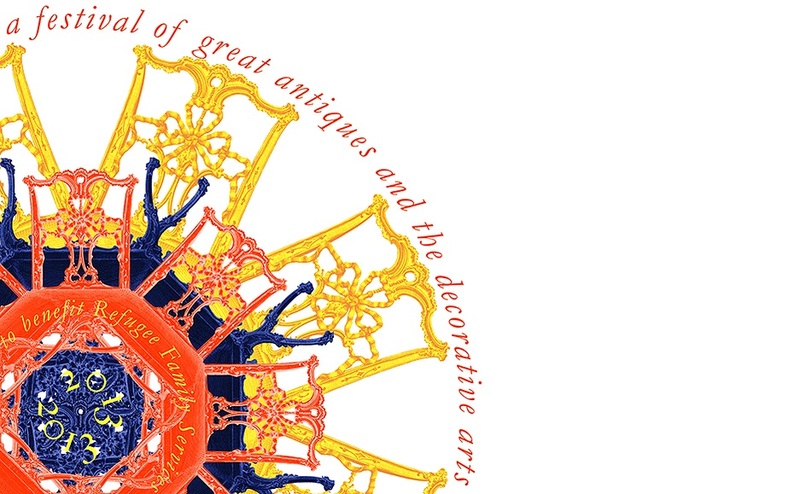 For more information, please visit the Cathedral Antiques Show & Tour of Homes website. 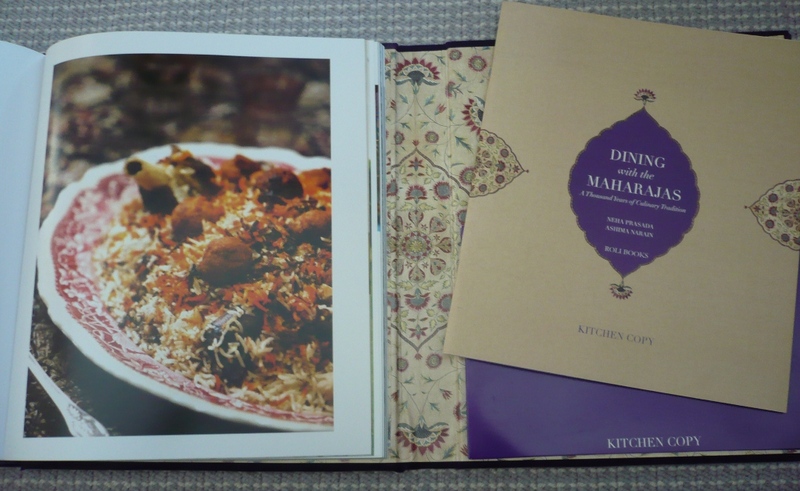 I recently received a review copy of a very interesting new book, Dining with the Maharajas: A Thousand Years of Culinary Tradition. 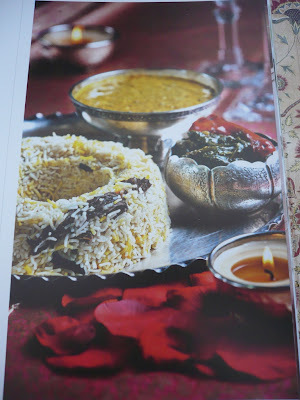 Written by Neha Prasad and with photographs by Ashima Narain, this book delves into the rich culinary history of India, specifically the cuisine and feasts that were prepared by royal Indian kitchens. 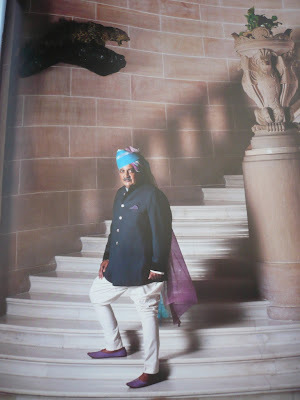 Each chapter profiles a different royal family (of Indian states such as Udaipur and Jammu and Kashmir, amongst others) and explores not only the history of their family's royal banquets but their style of entertaining today, too. 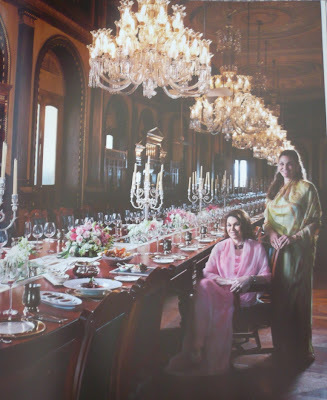 Although it seems that many of these royal families still live quite well today, there was a time not so very long ago when maharajas and their families lived most extravagantly. 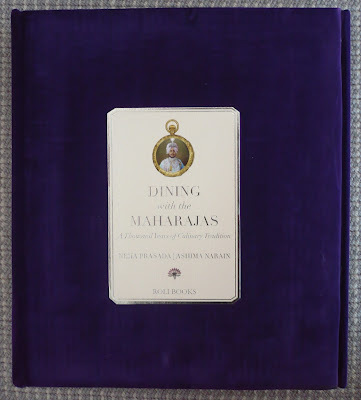 The book's introduction includes a quotation from the late Dowager Maharani of Gwalior Vijayaraje Scindia that sums up this extraordinary lifestyle quite nicely: "It was a fantasy world, Byzantine in its splendour with more in common with the French kings of the grand Siecle than with the world of today. Who after all can count his servants in thousands, or the tigers in their hunting preserves in their hundreds, maintain half a dozen enormous palaces and a dozen or so hunting lodges or country houses, give sit-down dinners for a hundred and fifty guests on special family plates that had been used for the banquets in honour of at least three British monarchs and one Czar?" 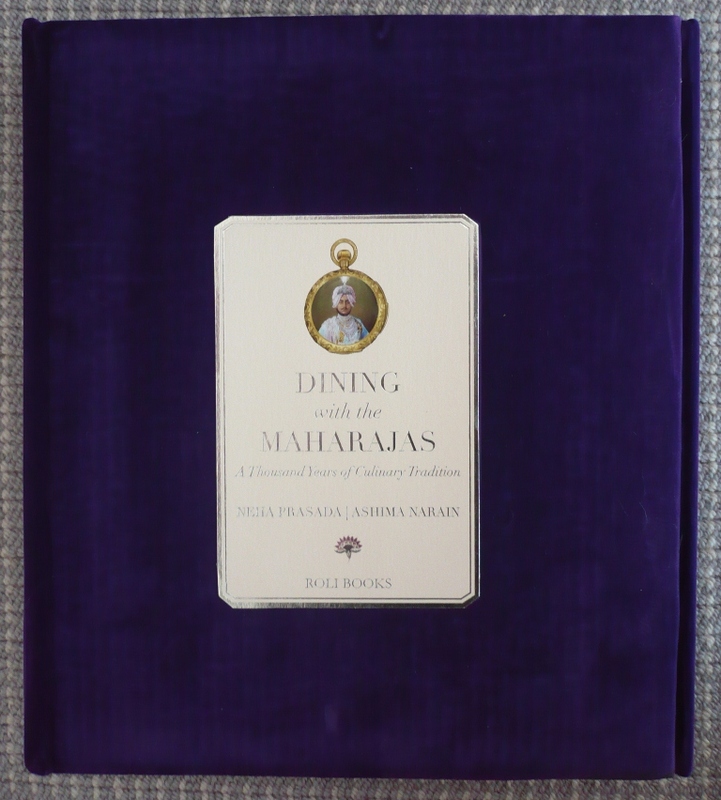 A fantasy world, indeed, but one which has provided the author with a wealth of anecdotes pertaining to the maharajas' lavish way with food. Not only is it fascinating to learn of these families' culinary traditions, but it's also interesting to see the way in which they live today. 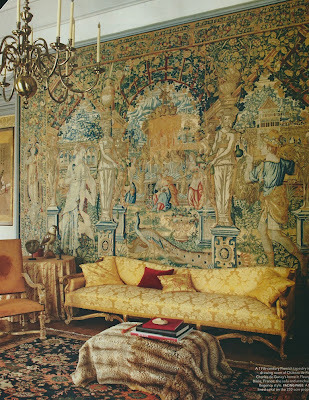 There are numerous photos (quite beautiful, I might add) that show their magnificent palaces, the antiques and relics with which they live, and the style in which they entertain today. 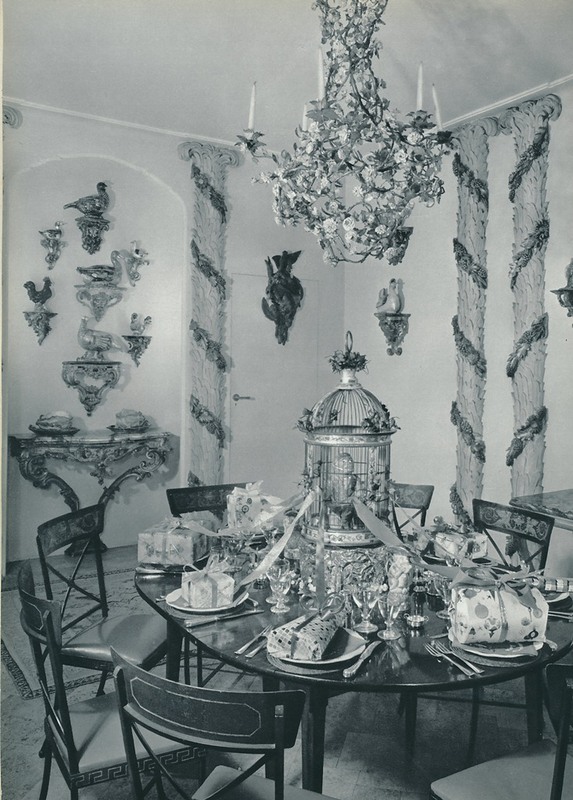 Although there is still emphasis on a well-set table (much of the china and table accoutrement are stunning), their entertaining seems to be far more relaxed than that of their ancestors. 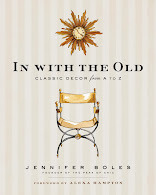 The bonus to each chapter are recipes that are enjoyed by current members of these royal families. As much as I love Indian food, I don't cook it at home because many of the ingredients are hard to find in my area, something which might dissuade me from attempting many of the book's recipes. 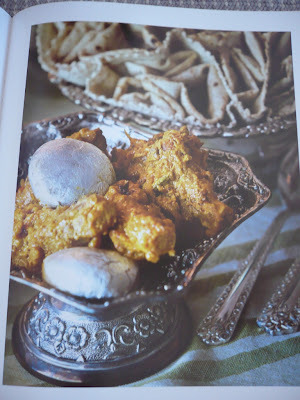 However, if you enjoy cooking Indian food at home, then I think you'll be very tempted to prepare some of these delicious looking dishes in your kitchen. 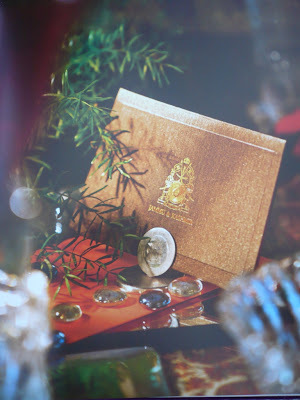 And I must say that this is one of the prettiest books that I've seen in a while. 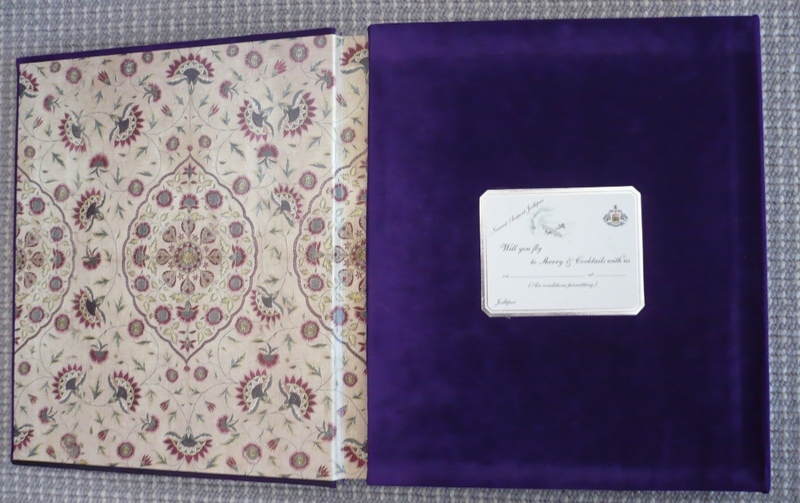 The book, completely covered in purple velvet, is a tri-fold book that, when open, boasts end papers that depict an antique Indian textile. 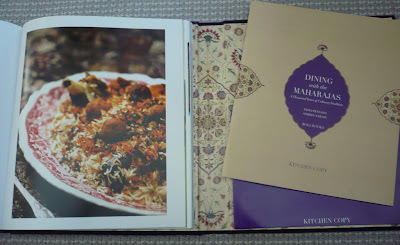 And not to worry about getting the velvet cover dirty in the kitchen should you attempt one of the dishes as the book contains a soft-cover kitchen copy of recipes. Very clever. 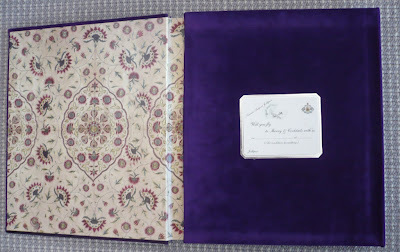 The book includes a charming replica of a fill-in invitation as well as a soft-cover book of recipes. Esra Jah and Shekyar Jah of the royal family of Hyderabad, sitting at their famous dining table which can seat up to 101 people. Tsar Nicholas II, King George V, and Franz Ferdinand all dined at this table. The Jammu and Kashmir royal monogram. Maharaja Gaj Singh II at the Umaid Bhawan Palace. Book photos from Dining with the Maharajas: Thousand Years of Culinary Tradition by Neha Prasad, Ashima Narain photographer. 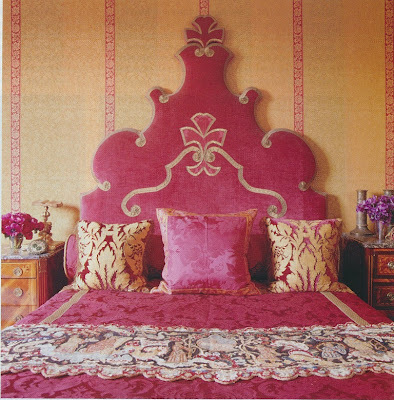 Damask was always lurking somewhere on my fabric radar, although truthfully it didn't hold a very prominent place. It's not that I don't find damask to be attractive. I do. I suppose that I have always thought it seemed more appropriate for homes that were exceedingly traditional or European in feel. 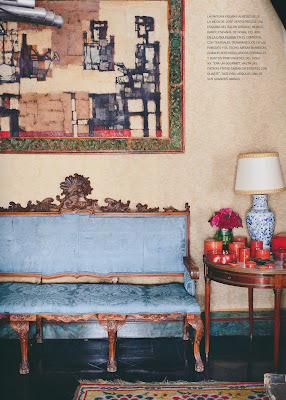 Damask just didn't seem to fit my city apartment, one that is a mix of antiques and modern-looking fabrics. But, my opinion completely changed when I saw the recent World of Interiors article on KK Auchincloss' Paris apartment. How many of you thought you had died and gone to heaven when you saw those photos? Not a week goes by that I don't look at that article, dreaming about how well I could live in such a home. 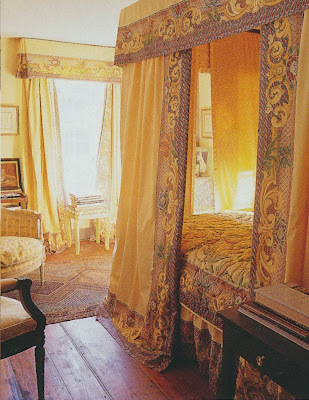 Anyway, it's Auchincloss' damask covered walls that got me thinking about how damask doesn't have to look so traditional. What makes this particular damask so fresh looking, to me anyway, is its unusual color. It's a slightly weird yellowish-green, a shade that is a little off-kilter when compared to the more common shades of pale or golden yellow, vivid red, or pale blue. 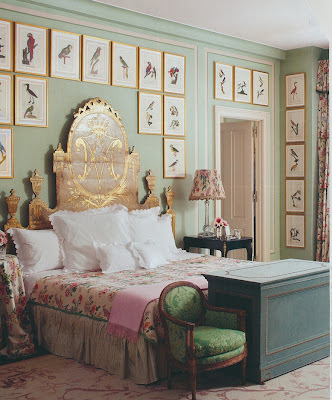 Although damask covered walls would look completely out of place in my apartment, I am thinking of adding just a touch of it somewhere. I am inspired by the 1960s-era photo below which shows a dark blue velvet sofa with pale blue damask pillows. My sofa is covered in teal velvet, so perhaps damask throw pillows, especially in a shade similar to Auchincloss' walls, might look nice, a way to bridge the gap between a modern sofa and the antique furniture that stands close by. Who knows? This dash of damask just might be the precursor to bigger and better things, maybe even a big girl apartment in Paris. 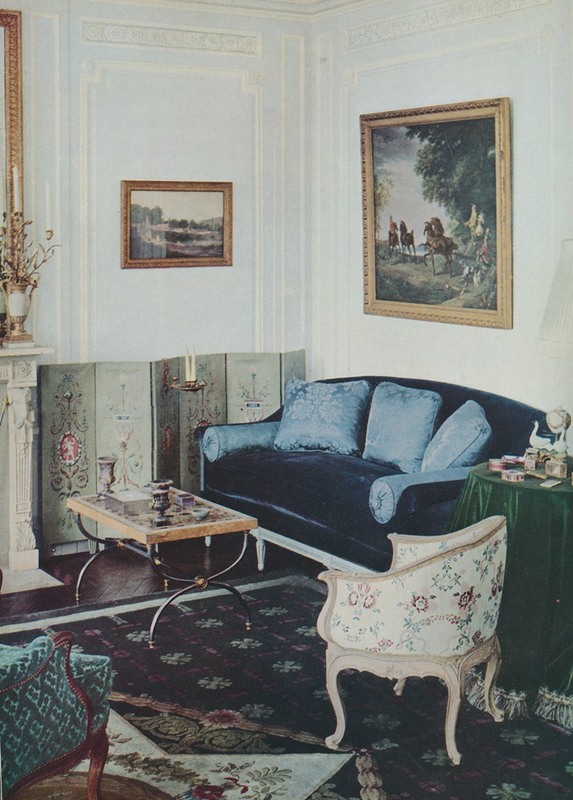 A 1960s-era living room with velvet sofa and damask pillows. 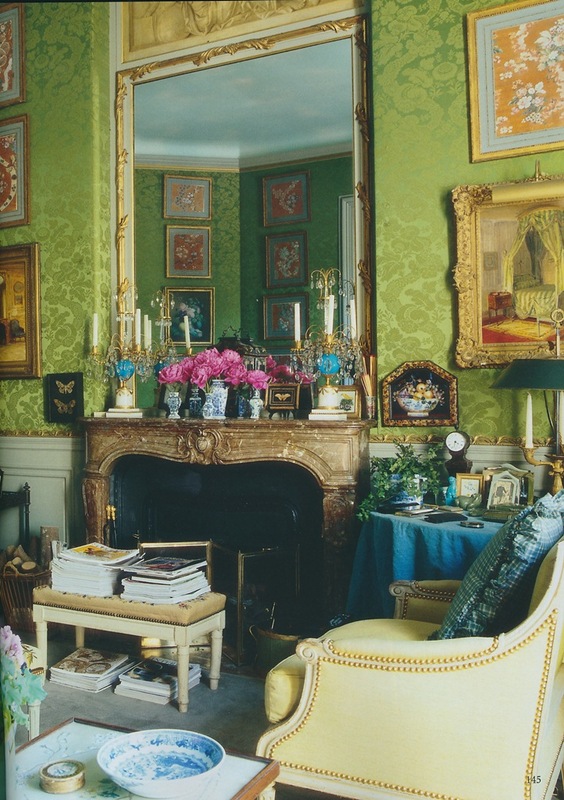 Image at top: Photo of the Paris apartment of KK Auchincloss, World of Interiors, November 2012, Fritz von der Schulenburg photographer. For some reason, birds and breakfast rooms seem to go hand in hand, perhaps because birds' cheery songs often mark the dawn of each day. One of the loveliest rooms in Atlanta is the Goodrum House's octagonal breakfast room, painted by artist Athos Menaboni to resemble a bird cage. You can see a photo of it below. Wouldn't you love to take your morning Wheaties in such a pretty room? 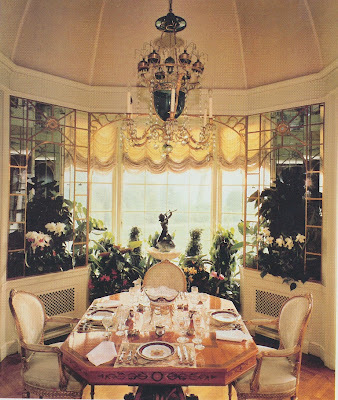 Then there is the very elegant breakfast room at the late Marjorie Merriweather Post's estate, Hillwood, that reminds me of a gilded cage, one in which I wouldn't mind being trapped. 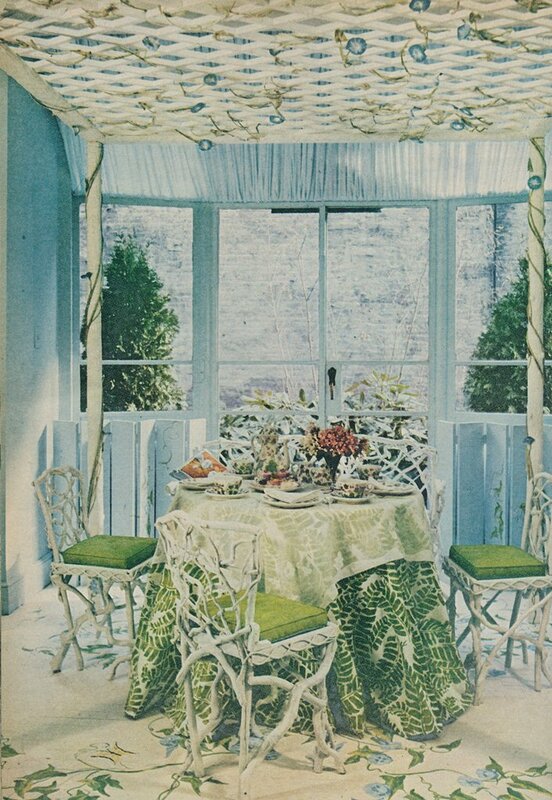 On the other hand, if birds seem too animated for early morning repasts, you could always festoon your breakfast room with painted flowers and trellis, another pleasant way to greet each day. 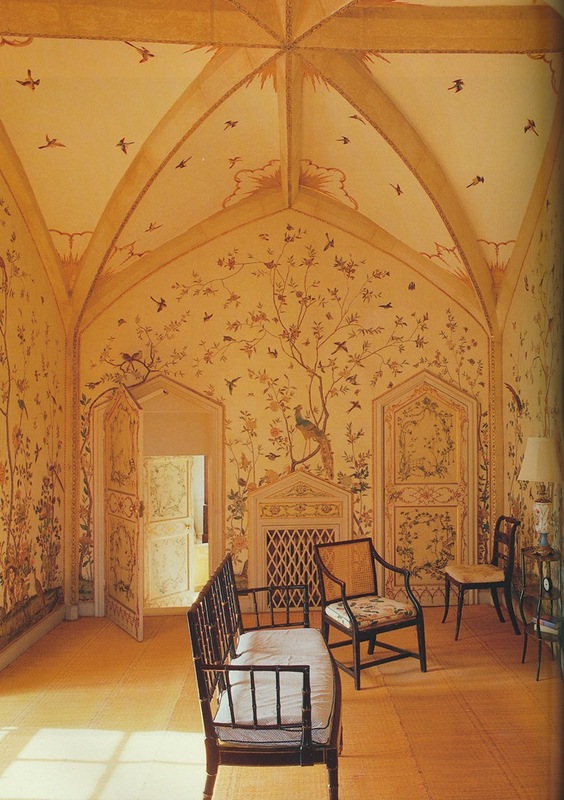 Although I doubt that I would take my breakfast room to such extremes, I do find designer David Barrett's morning glory room to be one of the most exuberantly decorated rooms in my recent memory. (See it towards the bottom of this post.) I don't know if the vines were real or not, but I like to think that they were. After all, that's part of the fantasy of such a fantastical room. 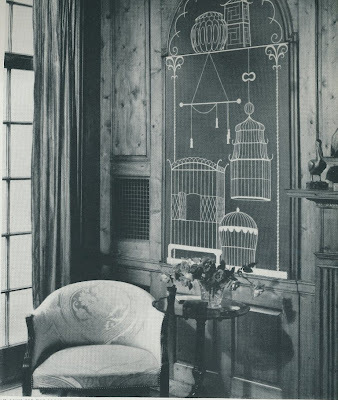 The bird cage breakfast room, painted by Athos Menaboni, at the Goodrum House, Atlanta. The house is currently undergoing a major restoration, one which should return the house to its former glory. 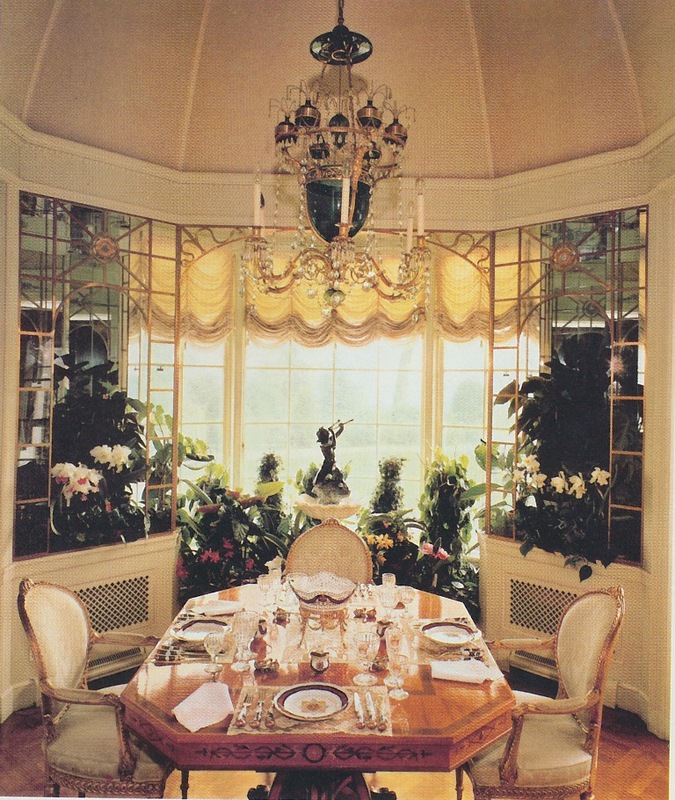 The Breakfast Room at Hillwood, the Washington D.C. estate of the late Marjorie Merriweather Post. 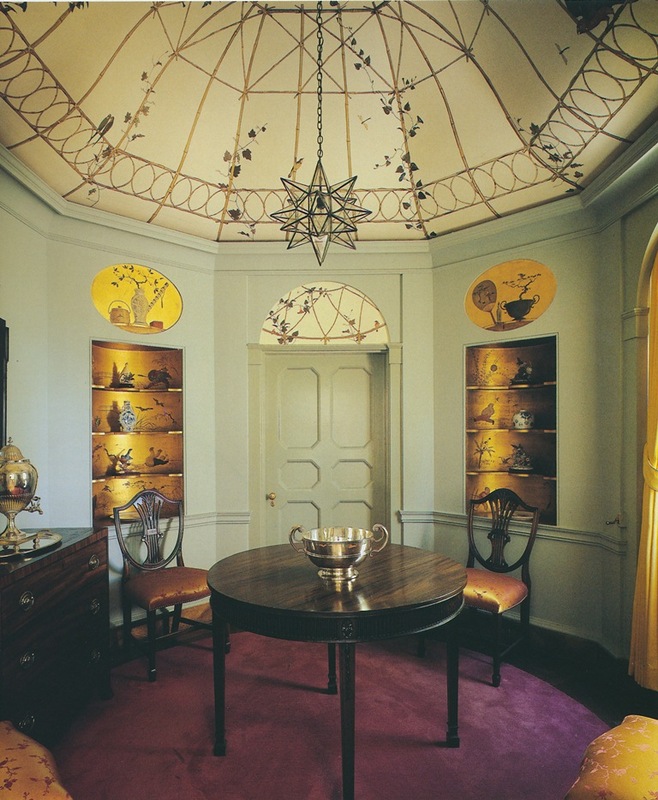 Although the room is meant to evoke a winter garden, the domed ceiling makes it feel a little like a bird cage. The book from which I found this photo only identifies it as a thirteenth-century Gothic room that had been decorated with Chinese paper. An internet search for more info led me to Architect Design, who identified the house as Grimsthorpe Castle in Lincolnshire, England. 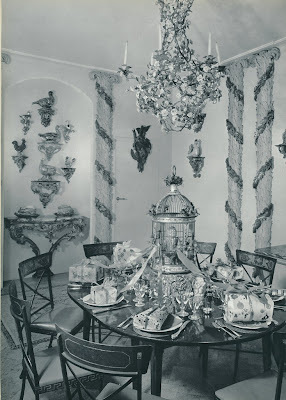 I have admired the Duc de Talleyrand's dining room for years. I think it's so chic. Rather than painted or papered bird decoration, the birds here were porcelain. 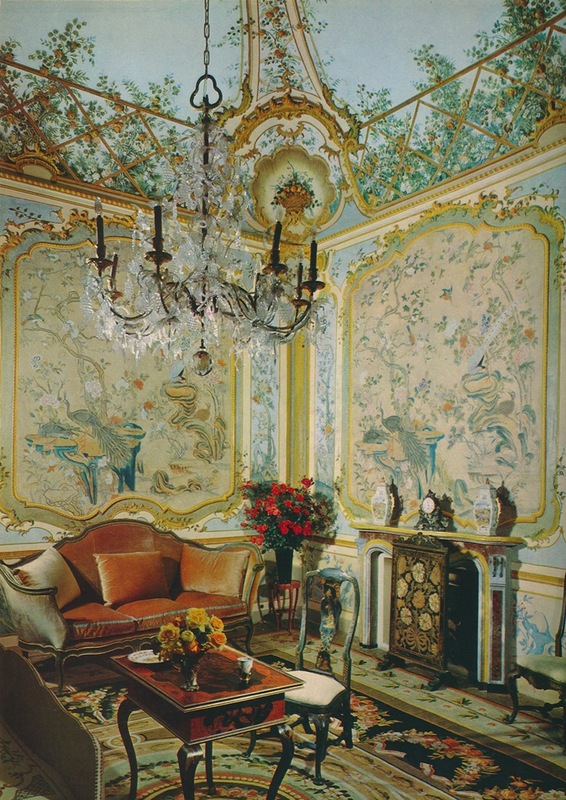 The drawing room at Palazzo Colonna, Rome. 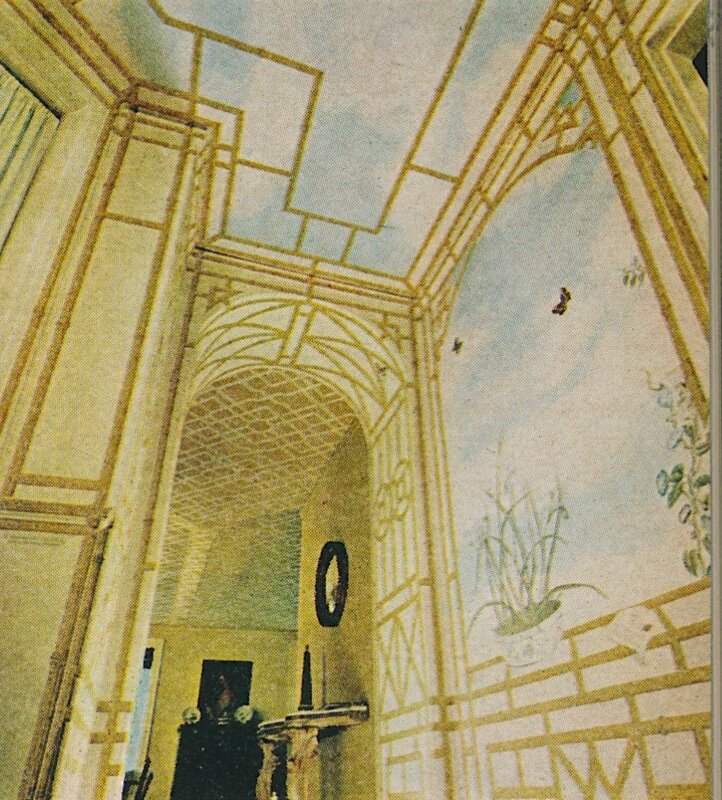 Chinese paper covered the walls, while lattice and flowers were painted onto the ceiling. That ceiling would look marvelous crowning a breakfast room, I think. 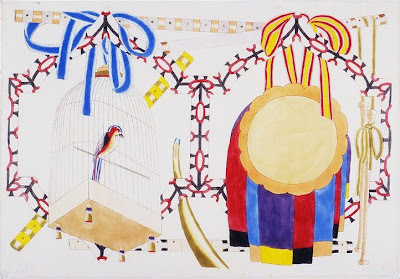 Allyn Cox painted this decorative bird-cage panel for the New York library of Mrs. James C. Rogerson. The panel served to protect the library's rare books from dust. David Barrett created this dining pavilion in 1971. A morning glory strewn canopied bed-frame was placed over a small dining table. The fern print table skirt fabric was by Quadrille. 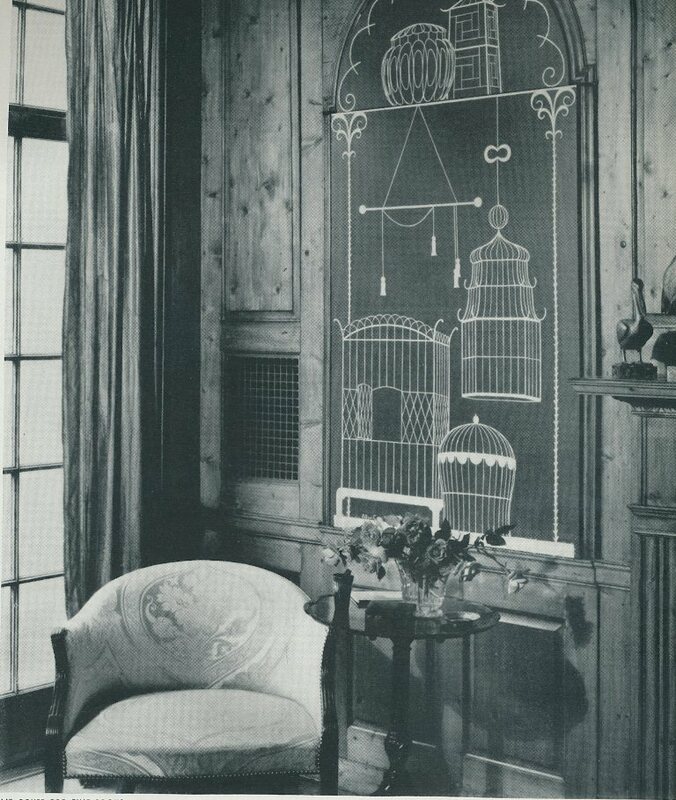 Although this trellis and butterfly mural appeared in the entrance hall of Maurice Moore-Betty's New York home, a similar mural would look great in a breakfast room, too. Moore-Betty, by the way, was a prominent cooking school teacher who taught out of his home. A few weeks ago, I learned of the recent death of designer Richard Nelson. Based in Newport, Rhode Island, Richard was a man of great style and immense charm. 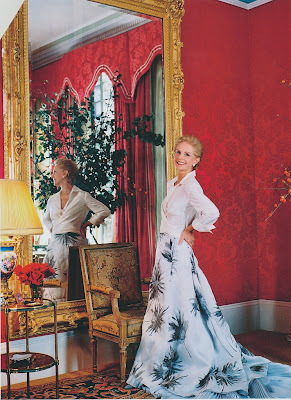 Having started his career with Sister Parish (even assisting her during the Kennedy White House redecoration,) Richard eventually moved to Newport where he set up his interior design business and became a much sought-after designer. He also became a fixture on the social scene there, making many friends who remained close to him until the very end. Although I never met Richard in person (and that is something which I greatly regret,) we had an email friendship over the past few years, touching base from time to time and discussing design. 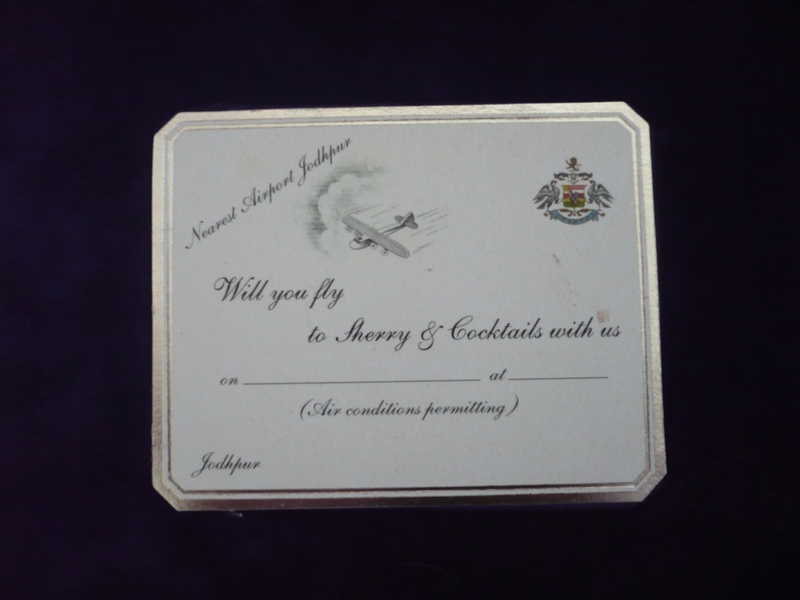 And the fact that we had two mutual acquaintances, both of whom had attended Attingham with Richard, made the friendship that much more personal. 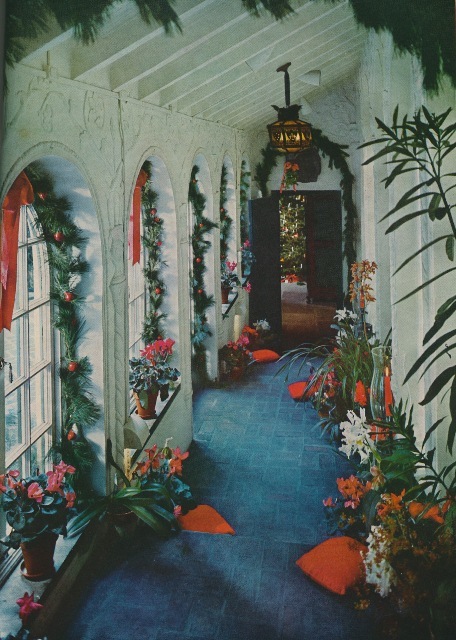 I wrote about Richard a few years ago when I covered a late 1960s Christmas party that Richard had hosted, one which was featured in an issue of House & Garden. (You can see a few photos from that article, including one of Richard, above.) 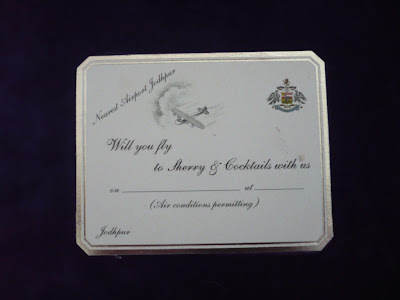 The details of the party impressed me as few people host such elaborate parties anymore. 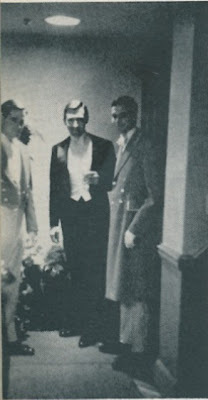 In fact, when speaking with Richard in anticipation of that post, he mentioned that while he lived in New York as a young man, he hosted guests at his home four to five nights a week! I can only imagine that this exuberant style of entertaining held him in good stead upon his move to Newport. 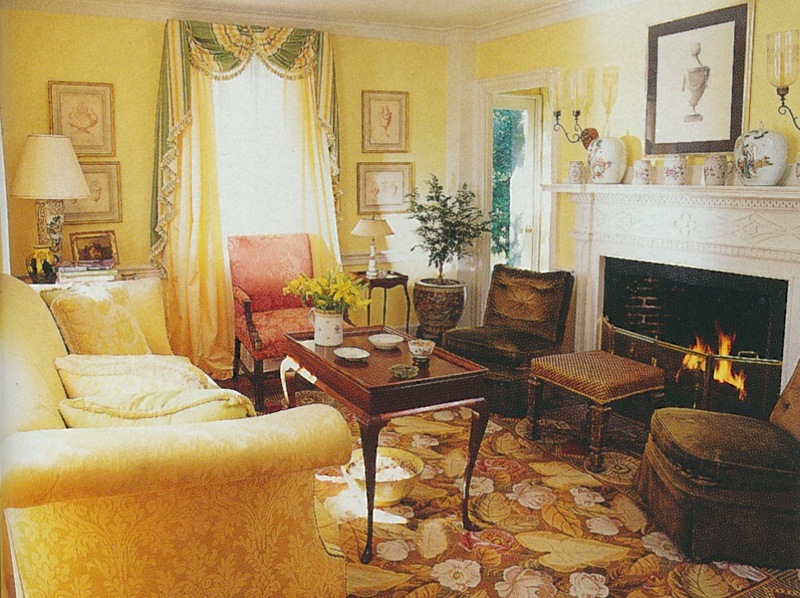 Over the years, Richard's work was featured in numerous publications including Architectural Digest. 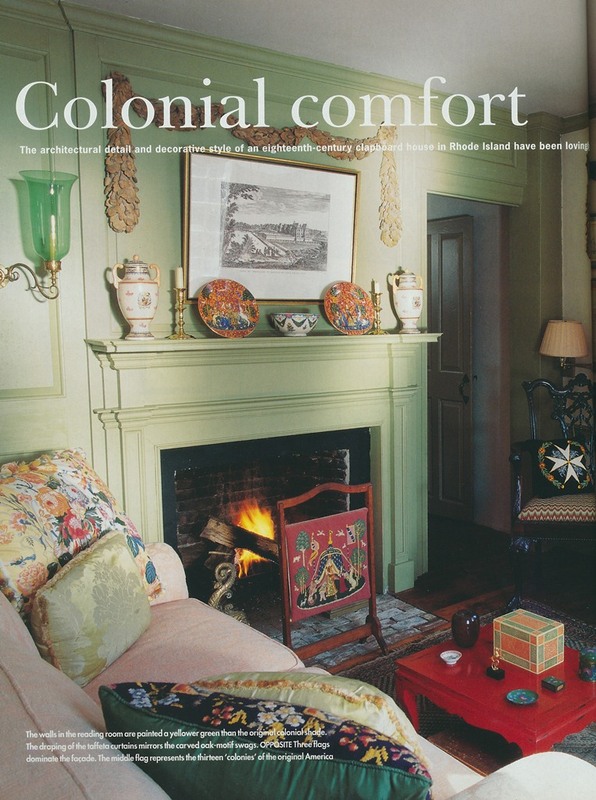 In 1998, the Colonial-era Newport house in which he lived with his partner was featured in British House & Garden. I am showing that article's photos below as I think Richard's house is a testament to the warmth and personality that traditional interiors do have when decorated well. I admire that Richard stayed true to the house's period and architectural style rather than attempt to turn it into something that it wasn't. I know that a number of Richard's friends read my blog, and to them, I extend my deepest sympathy. Richard was a decorator of the old-school and a bon vivant to boot, and they just don't make them like Richard anymore. 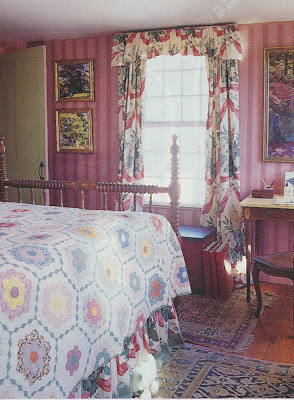 Nelson house photos from British House & Garden, January 1998, Keith Scott Morton photographer.